Honda Canada said its February sales grew 19 percent to 8,553 vehicles, according to DesRosiers Automotive. Average auto loan debt per borrower and delinquency rates rose in Canada in the second quarter as vehicle prices rose, customers took on additional debt and various regions continue to recover from the economic crisis, TransUnion said in its Canada Industry Insights Report released Tuesday. The average balance per borrower on auto loans was $20,447, up 2.4 "per cent from a year earlier. The increase was driven by an assortment of factors, such as vehicle price upticks and rollovers of negative equity, Matt Fabian, director of research and analysis for TransUnion Canada, told Automotive News. "We know in the industry there's a lot of debt consolidations. 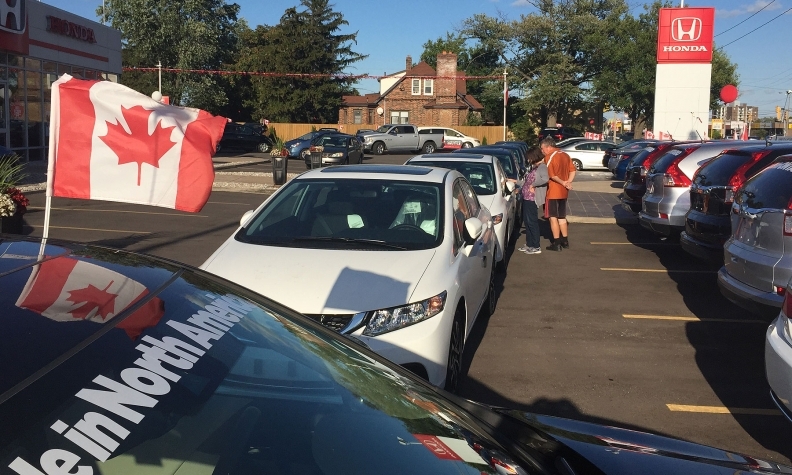 It's more prevalent in the U.S., but in Canada when they buy an automobile they might bundle the remaining debt from their automobile into their new one," he said. The average transaction price in Canada increased 13 "per cent to $36,468 in April, 3.6 "per cent to $32,544 in May and 3.3 "per cent to $33,501 in June, according to J.D. Power. The 90- and 60-day delinquency rates also climbed. Ninety-day delinquency rates increased to 1.47 "per cent, from 1.4 "per cent a year earlier, while 60-day delinquencies rose to 1.8 "per cent, vs. 1.7 "per cent a year earlier. Challenging economic conditions in areas heavily impacted by oil industry declines accounted for much of the rise in delinquencies, Fabian said. Provinces such as Alberta and Saskatchewan "that have been hit by the oil patch are still struggling, and not [only] in auto specifically," he said. "They are still strapped for cash flow, and they are making conscious decisions about where they're going delinquent. I think it's those regions driving the national number." The 90-day delinquency rate for all non-mortgage loans in the second quarter was 3.14 "per cent in Alberta, compared with 3.08 "per cent a year earlier. In Saskatchewan, it was 3.37 "per cent, down slightly from 3.38 "per cent, according to TransUnion's report. TransUnion measures loan originations one quarter in arrears, and first-quarter data were released this week. Originations in the superprime credit category, representing credit scores higher than 800, increased 1.6 "per cent in the first quarter. The prime-plus category, representing credit scores of 760 to 800, also improved, by 0.4 "per cent. The prime and below-prime categories fell, with subprime coming in with the largest decline at three "per cent. "When you look specifically at auto, we're seeing a lift in the number of accounts moving toward better than prime," Fabian said. "We saw a big lift in superprime and we saw a year-over-year drop in subprime. It seems like they're continuing to move their portfolio toward prime." The credit-tier shift could be a result of lenders aiming to balance their risk or it could be driven by consumers. "Consumers that are in that lower-than-prime tier might not have the disposable income or cash flow to afford a new vehicle so they're kind of exiting that," Fabian said. "Superprime may have more disposable income and are making decisions to purchase."